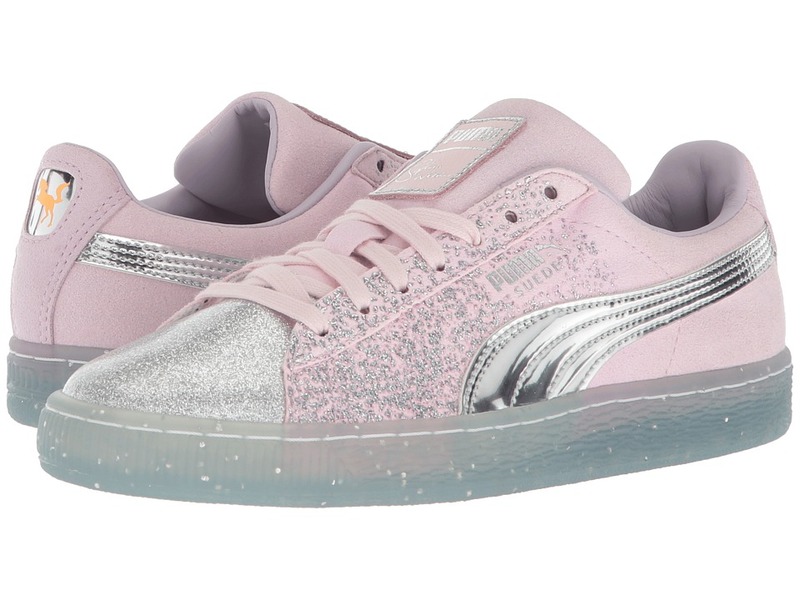 Embrace your inner princess when you~re strutting your stuff in the PUMA x Sophia Webster Basket Glitter Princess Sneaker. Man-made upper with glitter accent. Round-toe sneaker silhouette. PUMA logo at the tongue. Glittering stripe at the side. Man-made lining. Lightly padded footbed with embossed logo. Translucent rubber outsole. Imported. This item may ship with an attached security tag. Merchandise returned without the original security tag attached or a damaged tag may not qualify for a refund. Measurements: Weight: 11 oz Product measurements were taken using size 9, width B - Medium. Please note that measurements may vary by size. Weight of footwear is based on a single item, not a pair. 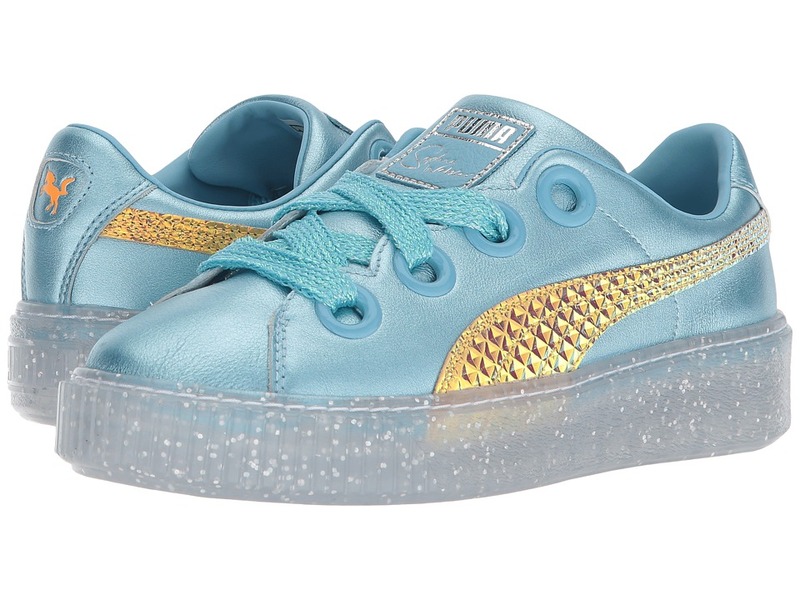 Channel your inner princess with this fun take on a classic style in the PUMA Platform Glitter Princess shoe! Part of the Puma x SOPHIA WEBSTER collection. Two-toned metallic upper. Oversized eyelets and chunky, sparkly laces. Thick, translucent, glittery outsole. Metallic, textured PUMA Formstrip at lateral sides. SOPHIA WEBSTER unicorn symbol at heel. Imported. Measurements: Weight: 15 oz Product measurements were taken using size 9, width B - Medium. Please note that measurements may vary by size. Weight of footwear is based on a single item, not a pair. 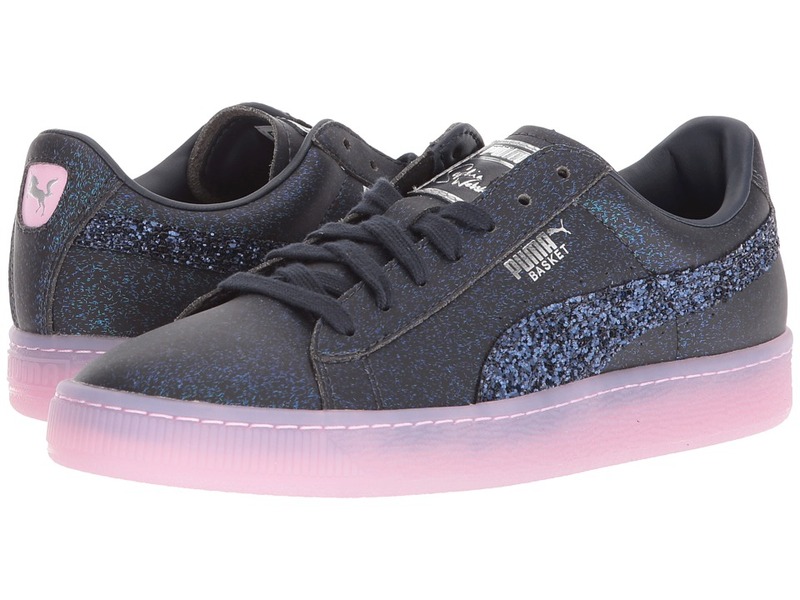 Embrace your inner princess when you~re strutting your stuff in the PUMA x Sophia Webster Suede Glitter Princess Sneaker. Suede leather upper covered in glitter. Round-toe sneaker silhouette. PUMA logo at the tongue. Metallic leather stripe at the side. Leather lining. Lightly padded footbed with embossed logo. Translucent rubber outsole. Imported. This item may ship with an attached security tag. Merchandise returned without the original security tag attached or a damaged tag may not qualify for a refund. Measurements: Weight: 11 oz Product measurements were taken using size 8.5, width B - Medium. Please note that measurements may vary by size. Weight of footwear is based on a single item, not a pair. Let her beauty take flight wearing the Sophia Webster Bibi Butterfly Feather Print flat. Printed leather upper. Slip-on construction with adjustable buckle ankle strap. Round toe silhouette. Half butterfly wing at toes. Soft, leather lining. Lightly padded, leather footbed. Leather sole. Made in Brazil. This item may ship with an attached security tag. Merchandise returned without the original security tag attached or a damaged tag may not qualify for a refund. Measurements: Weight: 1 oz Product measurements were taken using size 6-12 Months, width M. Please note that measurements may vary by size. Weight of footwear is based on a single item, not a pair. 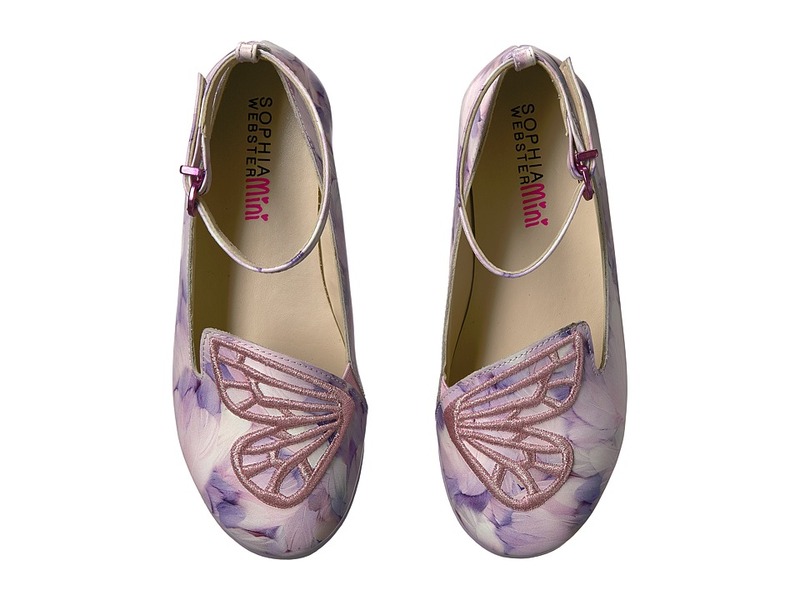 Let her beauty take flight wearing the Sophia Webster Bibi Butterfly Feather Print flat. Printed leather upper. Slip-on construction with adjustable buckle ankle strap. Round toe silhouette. Half butterfly wing at toes. Soft, man-made lining. Lightly padded, man-made footbed. Durable man-made sole. Made in Brazil. This item may ship with an attached security tag. Merchandise returned without the original security tag attached or a damaged tag may not qualify for a refund. Measurements: Heel Height: 1 4 in Weight: 4 oz Product measurements were taken using size 31 (8 Years), width M. Please note that measurements may vary by size. Weight of footwear is based on a single item, not a pair. She will come right out of her personal cocoon with brilliance wearing the Sophia Webster Bibi Low Top. Leather upper. Slip-on construction with hook-and-loop strap closure. Round toe silhouette. Breathable mesh lining. Lightly padded, textile lining. Durable, synthetic sole. Made in Brazil. This item may ship with an attached security tag. Merchandise returned without the original security tag attached or a damaged tag may not qualify for a refund. Measurements: Weight: 6 oz Product measurements were taken using size 30 (7 Years), width M. Please note that measurements may vary by size. Weight of footwear is based on a single item, not a pair. 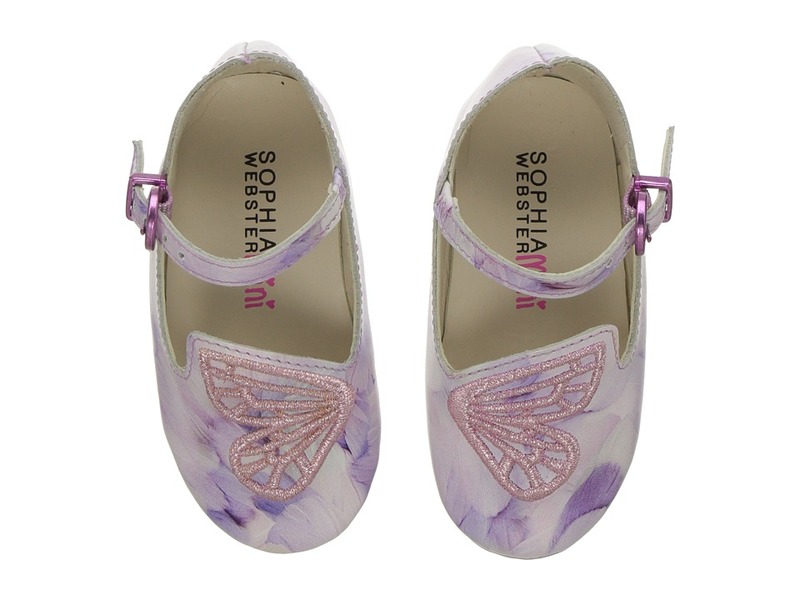 Your little one will have added pep to her step wearing the Sophia Webster Chiara Embroidery. Metallic leather upper. Slip-on construction with adjustable buckle ankle strap. Round toe silhouette. 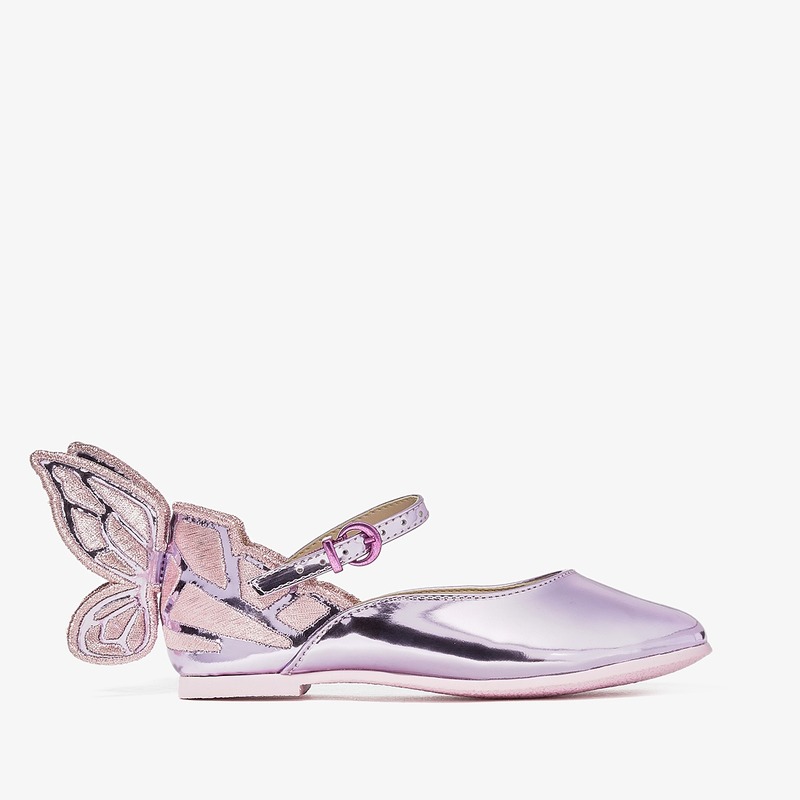 Three-dimensional, metallic butterfly detail at heel. Soft, man-made lining. Lightly padded, man-made footbed. Durable man-made sole. Made in Brazil. This item may ship with an attached security tag. Merchandise returned without the original security tag attached or a damaged tag may not qualify for a refund. Measurements: Weight: 1 oz Product measurements were taken using size 6-12 Months, width M. Please note that measurements may vary by size. Weight of footwear is based on a single item, not a pair. Your little one will have added pep to her step wearing the Sophia Webster Chiara Embroidery. Metallic leather upper. Slip-on construction with adjustable buckle ankle strap. Round toe silhouette. 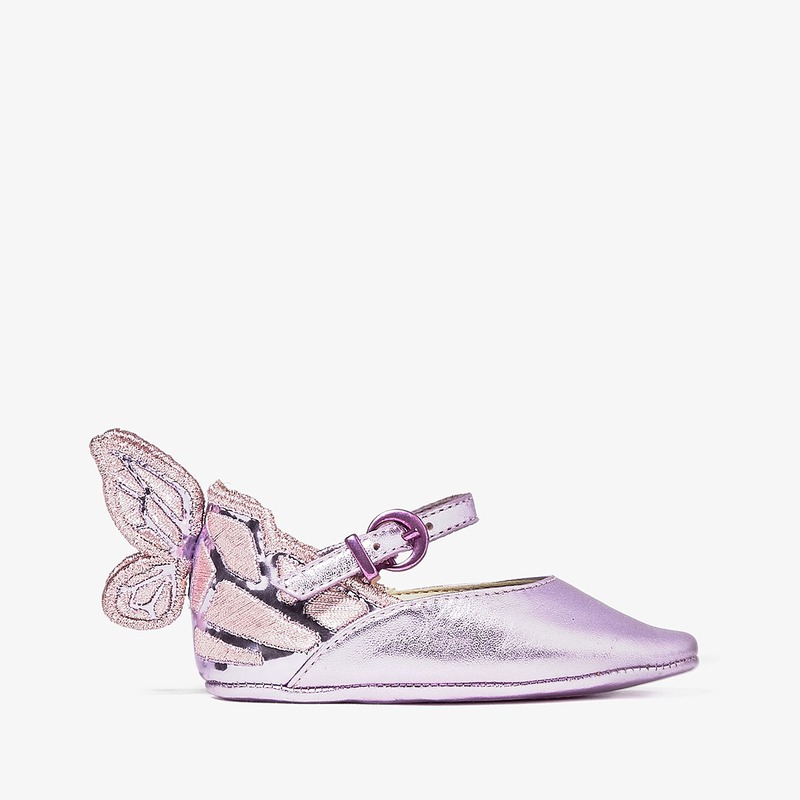 Three-dimensional, metallic butterfly detail at heel. Soft, man-made lining. Lightly padded, man-made footbed. Durable man-made sole. Made in Brazil. This item may ship with an attached security tag. Merchandise returned without the original security tag attached or a damaged tag may not qualify for a refund. Measurements: Heel Height: 1 4 in Weight: 4 oz Product measurements were taken using size 30 (7 Years), width M. Please note that measurements may vary by size. Weight of footwear is based on a single item, not a pair. Give your little one a flamboyant step wearing the Sophia Webster Kingston Flamingo Sneaker. Velvet upper with leather trim. Slip-on construction. Twin pink flamingos with pompoms at toe. Round toe silhouette. Plush, textile lining. Lightly padded, textile footbed. Durable, synthetic sole. Made in Brazil. This item may ship with an attached security tag. Merchandise returned without the original security tag attached or a damaged tag may not qualify for a refund. Measurements: Weight: 4 oz Product measurements were taken using size 28 (5 Years), width M. Please note that measurements may vary by size. Weight of footwear is based on a single item, not a pair.